Rosehaven Cottage: Happy St. Patrick's Day! Today, I spent the afternoon in my third week of floral design class. 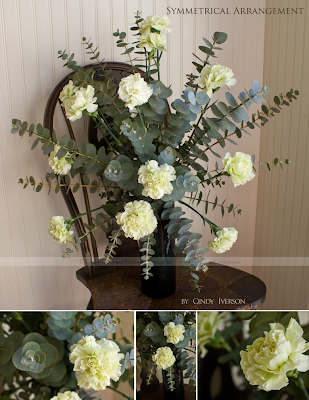 Last week, I had asked our instructor to try and find me some green carnations for St. Patrick's Day. And she did! We learned how to make a symmetrical arrangement today. Part of the arrangement was learning how to wire eucalyptus stems. Along with that lesson came the lesson that woring with eucalyptus makes your fingers very sticky (fortunately, I had gloves). As simple as a symmetrical design looks, I have to tell you that it is a very difficult arrangement to achieve. Mine isn't truly symmetrical, but I can't be too hard on myself because it was my first attempt. I think it looks great & very festive for the day! Happy St Patrick's Day to you too Cindy! You did a great job on the flower arranging. I bet they smell really wonderful, I just love the look..
Cindy...that's very pretty! I'm glad you are enjoying the class. I guess that would be a pretty difficult thing to achieve...since I naturally want to unbalance the balanced...and prefer the non-semetrical type of balance. Tricky. Looks cool though. You are learning so much! I'm glad you are taking this class. I can just smell the eucalyptus now! Oh wait, I can if I want to... just go in Bek's backyard! Nice job...sounds like a fun class. Very pretty design. Green carnations? I had no idea they even existed. They look cool though. Very pretty!! I love the smell of eucalyptus. Late Happy St. Patrick's Day!